I want to get into this so I’m going to use this area of my blog to assemble all the bits and pieces. I have a vacuum chamber which I have used a bit – and a pressure pot which I have not. To start with, take a look at the following video which is a basic overview of the difference between the two. A look at using a Vacuum Chamber vrs a Pressure Pot. In this case the guy is using the Pressure Pot for his woodworking. Vacuum makes the bubbles larger, so that they will float up to surface and pop. If the bubbles originate on the edge of an embedded object, they will have a greater chance of dislodging. After degassing, the resin is returned to atmospheric pressure before it gels. Pressure makes the bubbles smaller, so that they will be invisibly small in the hardened resin. It must be applied from the time the resin gels (or before) until it solidifies. Either or both can be used, as the processes compliment each other. I’ve used both on some of my Polyester Resin (PR) and Alumilite Clear casts. Vacuum alone works well on low viscosity resin such as straight Silmar 41 (provided you pour before it gels). Some people have also had success thinning PR (with heat or with styrene) without vacuum. Viscous resins such as Alumilite Clear or thickened PR require pressure — vacuum alone is not sufficient. I also use pressure on Alumilite White and Alumilite Black. Peter Brown covers the difference between a pressure pot and vacuum chamber with a test run with resin for each. An article by EnvironMolds Artmolds titled “When to Use Pressure Pot and Vacuum Chamber” effectively summarizes for us (linked). In summary, the vacuum chamber is used primarily to eliminate unsightly air bubbles in hard setting materials, whereas, the vacuum chamber can be used for both degassing rubber and hard setting materials, but is best adopted for rubbers such as silicones and polyurethanes. I purchased this off of the Alumilite website a couple of years ago. 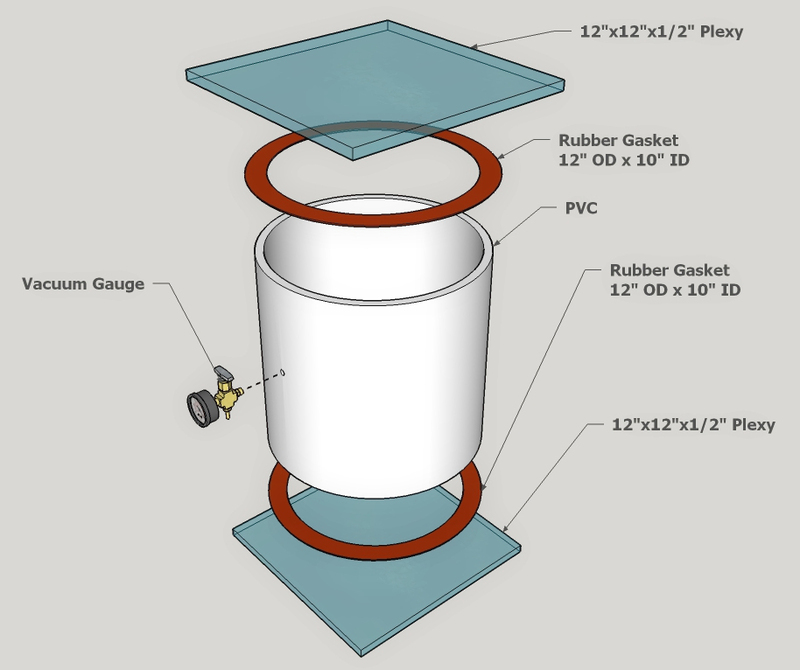 It is pretty simple .. a large PVC coupling (I think it is Schedule 80 – 10″ pipe), with gaskets, and 1/2″ thick plexiglass. A vacuum gauge and brass cross-fitting completes the assembly. I also noticed that the center ID ring is quite crudely finished (like .. not). I need to take a Dremel to that. I was cleaning things up today and noticed oil all over everything. Then to my dismay I found the tube that ran between the vacuum chamber and the vacuum pump was full of oil. A closer look told me the pump itself was leaking like crazy. I am guessing that leaving it downstairs through summer heat and freezing winter did something to internal seals. 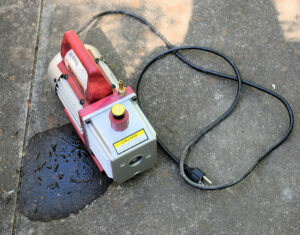 This pump is a Harbor Freight 3 CFM pump. The Harbor Freight 2-1/2 gal. 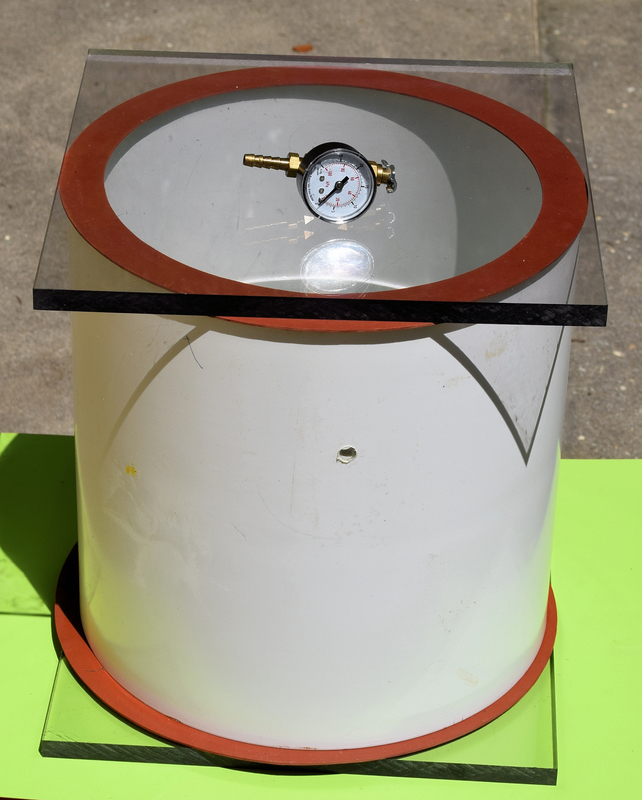 Air Pressure Paint Tank is rated at 60 psi maximum pressure. Working pressure is 30-60 psi. I would try to see how it works at 40 psi – no more than 50 psi. The import thing here is the pressure relief valve. The one that comes with the tank is adjustable but I would keep an eye out for a replacement from a name brand. Safety and all that.